Travelling to Stoke, Corby, Newquay, Wilmslow, Derby, Wellington, Evesham and regularly appearing at Club De Danse, Colchester, Flamingo Club, London, Top of the Town, Manchester, Victoria Ballroom, Cambridge, Tavern Club, Norfolk, Drill Hall, Newmarket, Regal Ballroom, Derby, Casino Club, Leicester, Glen Ballroom, Llanelly, Twisted Wheel, Blackpool etc., they built quite a following. During May and June, demo recording sessions at Tetlow Studio produced tracks such as Gotta Get Away and I’ll Always Love You in an attempt to represent a sound more representative of their live performances. In August, the group became The Frame and during September and October, She, Leave That Town, My Feet Don’t Fit In His Shoes and The Spiv were recorded for RCA. She was released in November on the same record label as Elvis! To support its release, a nationwide contest to find Miss She was won by a very attractive model who shared with the boys a night out in London. A Radio Luxembourg show was recorded at Tiles and an appearance on “Pop Inn”, both in London, the latter for the BBC Light programme. Unfortunately, even with these promotions, advertising and extensive touring, their first release failed to “take-off”. Whilst quite pleased that the material was their own compositions, the band were not happy playing their record live, as it was not in vogue with their current so called “comfortable music” on stage presentation, which had more of a Bluesy, Tamla, Soul/Rock, Dance orientated style. During this year, their new van had an engine replacement. Nobby had passed his driving test having been coached by a professional police driver. At a memorable gig at Birmingham University supporting The Who, Brian attempted to match the Who’s volume output (and wreck some equipment) by blowing his base speaker. The speaker was of considerable size and at the end of the night was placed in the van on the settee. The settee formed the van’s rear seating together with other features including upholstered ceiling and walls, a drinks cabinet, hanging vines and other items of ambient magnificence. The next morning, the lads planned to drop the speaker into Ringway Music for repair. Then Brian received a phone call – “Our Rob’s going to be a little late, he’s had a bit of a bump in the van”. “Ok, Mrs. Adams. I’ll walk round”. As Brian rounded the last bend en route to Nobby’s, he noted a mass of twisted green metal wrapped around a rather surprised looking oak tree. “Hmm”, he thought “that scrap someone has dumped is exactly the same colour as our recently repaired van. Oh no! it can’t be… It was and further more it was right outside Nob’s driving instructor’s house! It turned out that as Nob turned the corner, the speaker fell over, Nob looked behind and the van veered across the road, wrapping itself round the tree. Although the van was a write-off, Nob was Ok – until the rest of the group saw him! 1967 was surely the year to make it big?! 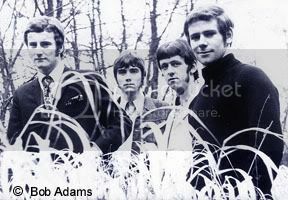 The band now had a London agent, Jim Godbolt. They were the first British band recording on RCA GB Ltd. Contracted to RCA Victor for five singles. Interpop had been appointed to handle their PR nationally and they had a booming Fan Club. Their personal manager at this stage was Keith Mallet, who was the sole UK agent for The Monkees Fan Club, Mick Dolenz himself being a great admirer of The Frame. During January, they twice visited IBC Studios in Portland Place to record their next single. Two numbers, both written by Brian Harbison and produced by Peter Roddis resulted in Doctor, Doctor on the A-side and I Can’t Go On on the B-side. This flipside was approaching the natural live feel that the band had developed whilst Doctor was considered to have a greater chance of commercial success. Doctor, Doctor was released on 24th February 1967. It should have been titled with just one medical opinion, “Doctor”, but got too far in production to change! The sheet music was printed and the publisher was Feldman. 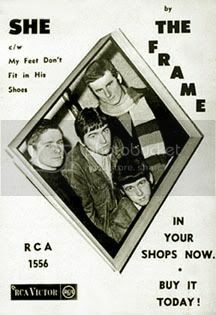 The release date was supposed to coincide with The Frame’s return from a tour of Finland but this tour was postponed. A gruelling but rewarding nationwide tour was embarked upon to promote their new disc. It encompassed all types of venues – ballrooms, all nighters, jazz clubs and the universities and college circuits as far north as Scotland and the South, East and West coasts, not forgetting the venues in and around Birmingham. By May, a general air of despondency was developing in the group, morale was running low as the second record had not been a hit. The lads seemed to be spending all their time on the road, with little time for developing new material and even resting! At the end of May, they left Immingham to sail to Helsinki via Gothenborg. This was to tour Finland and was rescheduled from January. Back in high spirits, they were to play fourteen shows and the performances were to include them backing a Mancurian singer called “Charles Stuart”, as well as their own “stand alone” spots. On arrival at Helsinki, the boys were surprised by the number of girl fans awaiting their docking. “They knew our records, life histories, likes and dislikes and even our shoe sizes!” commented Brian “and they followed us everywhere – to the hotel, site seeing, to lunch, into the sauna! the woods!, to buy illegal booze off the ships in dock and to all the gigs”. They were a great bunch of fans, we called them “The Roses”. However, the band weren’t as popular with the blokes. They were very jealous and when drunk on illicit alcohol, would stare them out on stage and start fights after the shows. Most of this was handled by their Finnish Road Manager “Yori”, who was quite good at sorting all manner of things out! Playing up as far as the Russian border, in Kotka, they were returning home with quite a few of “The Roses” (16) only to realise they had left Mick behind! On the return sea voyage, they played on board a Russian ship by request of the Captain, who had heard of their successful tour. Back on English soil, the band auditioned for a part on BBC TV. It was a play to be called Private In The Army featuring Charles Stuart. Having learnt all the songs to the point of being successful at the audition, it fell through due to Equity problems. This event, coupled with the anti-climax of returning from Finland to the less exciting prospects at home, made some of the lads start thinking it was time to get an “Ernie” (9 to 5) type job! 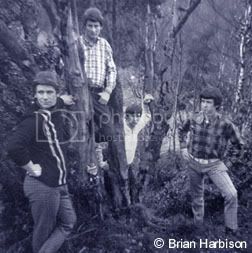 They played their final performance as The Frame, at The Belfry, Sutton Coldfield on 26th June 1967. “Why did you pack it all in? Weren’t things going well? I mean, money for old rope for an hour’s work a day, seems like the good life”. “Yeah, sure” Bob recalls. It was a cold, wet winter weekend – two bookings in Carlisle and two in Stockport were in prospect as we trudged to the first venue in our grimy, lipstick covered van. After set-up and a successful sound test “Icicles, Popsicles, Testing 1, 2, 3”, we played an inspired gig to a receptive audience who pulled Mick off stage by his moustache! This is the life! Next day was spent hanging around awaiting the next gig at the same venue. Practise during the day in this case proved perfect when we performed I Am Louisiana Red for 20 minutes to another enthusiastic crowd, for whom we signed autographs, knickers, etc. Yes this is definitely the life! Next day on the way to Stockport, an extremely loud knocking noise came from the engine accompanied by brown gunk, which sprayed out all over the place and received an expert diagnosis from Mick the mechanic, “The engine’s failed!” After sitting on the hard shoulder (in the rain), for what appeared to be hours, a replacement van arrived into which we loaded our gear (in the rain) and sped off to arrive late at the gig, a fact which did not go unnoticed by the promoter, who announced that he would be adjusting our fee accordingly. Is this the life? During the interval, Brian and I set off on foot (in the rain) to look for accommodation – no such luck! After playing the second set, not that enthusiastically, we approached the promoter to ask him for permission to leave our gear overnight, and, in the interests of security, could we accompany it? Suffice it to say that we were extremely fortunate to obtain a resolution whereby the kit stayed but we didn’t! Are we sure this is the life? 2am walking the streets of Stockport (in the rain), in a fruitless search for accommodation, we arrived wet and despondent at the Police Station. “What’s the matter with you lot? You look as though you’ve committed a crime”. “No sir” (right answer). “Have you any money?” “Yes sir” (wrong answer). “Well you can’t stay here then!” What a strange British custom it is that recognises a vagrant as someone without a shilling in his pocket, who can then at the taxpayers expense spend a warm, dry and presumably comfortable night in a cell. What a life! A tedious walk (in the rain) found us at a B & B of dubious reputation. A memorable night was spent in a dormitory with cockroaches and truckers who were not overly impressed with our 4am arrival. Get a Life! After little sleep and another fun-packed day (in the rain), we made a once and only, never to be repeated appearance in our underclothes – everything else was wet! The equipment was left at the venue as we trudged (in the rain) to the railway station. After waiting all night, we caught the milk train “All change at Crewe” to Birmingham, arriving at lunchtime the following day. Is this a life? Our fathers kindly helped retrieve our means of livelihood from up north. At great and obviously unexpected expense, we had to hire a van, whilst ours was fitted with a new engine. Upon its completion, we had to repatriate our vehicle back to Birmingham. At Â£40 a gig, this was not exactly the life of Larry! for supplying this exclusive story of The Frame. Copyright © Bob Adams & Brian Harbison.